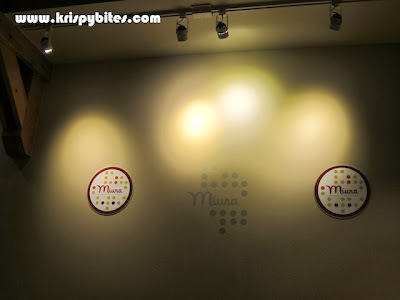 Py and Mau5 visit Miura Waffle Milk Bar on Boxing Day 2013! I went with Mau5 to their opening. Upon arriving, we were served three milkshake samples: salted caramel, sweet corn, and a multi-bean drink. The salted caramel was the most Western of the three drinks we sampled, as well as the sweetest. 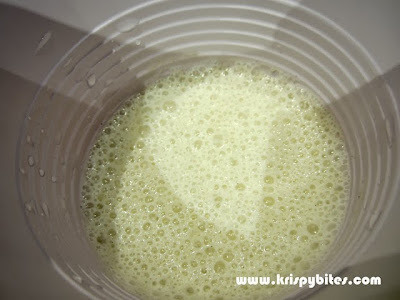 There was less ice than in a regular milkshake, resulting in a more milky texture, as Mau5 noted. 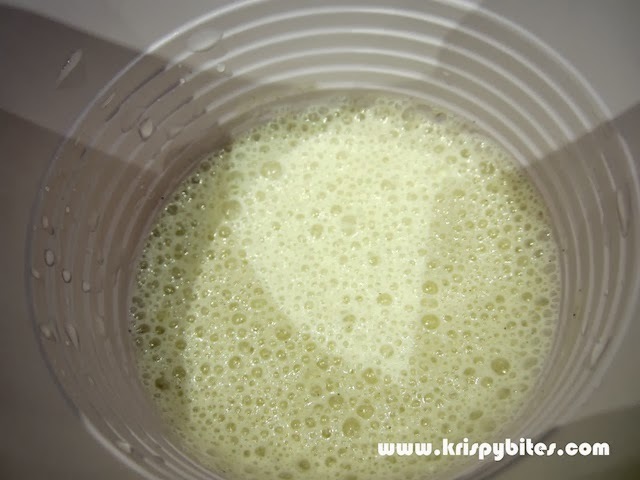 The sweet corn shake tasted like a sweeter, cold version of a corn chowder, with bits of corn pulp and skin inside for added texture. 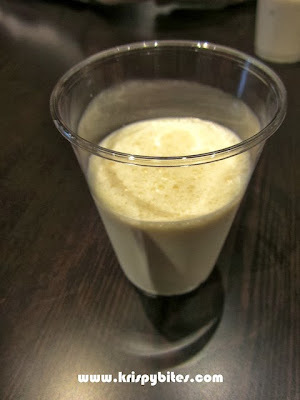 The multi-bean drink was a blended shake of many types of beans: the waitress rattled them off so quickly we couldn't catch them all, but there was red bean, black bean, mung bean, something with rice in it, amongst others. I don't recall hearing black sesame being recited in the ingredient list, but there was a strong hint of black sesame in the drink. 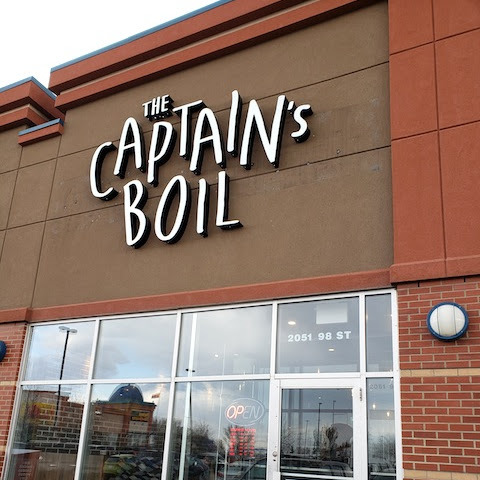 Of the three, the multi-bean was the most Asian, being reminiscent of the cold and better blended version of Asian bean soups. 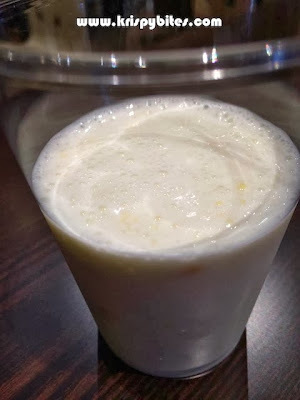 That leaves the sweet corn to be the most fusion drink: a title you will understand once you try the drink, epecially if you're well-acquainted with Asia's fusion cuisine. After the drinks, we received our first waffle sandwich sample: the wasabi mayo salmon with lettuce. To our surprise and delight, the salmon bits were baked into the waffle itself! 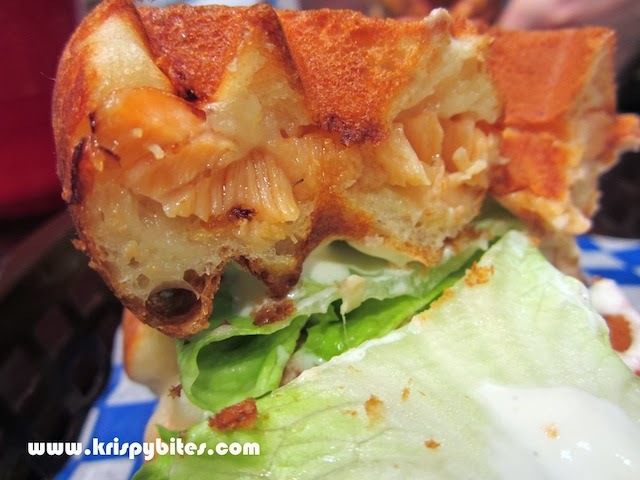 For me, the highlight of this sandwich was the wasabi mayo dressing: light mayonnaise with just the lightest zing of wasabi to complement the salmon flakes and the crunch of the lettuce without overwhelming your tastebuds. Mau5 instantly loved this waffle sandwich, declaring it his favorite and sticking with his decision even after all the other waffle sandwiches we sampled. 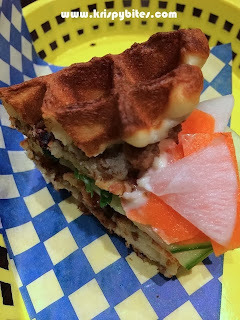 The next waffle sandwich we tried was the bulgogi. 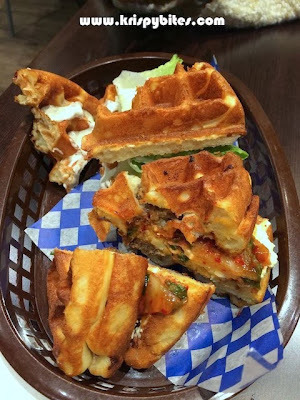 This time, beef was baked into the waffle, with kimchi and fried egg sandwiched between the waffles dressed with teriyaki sauce. 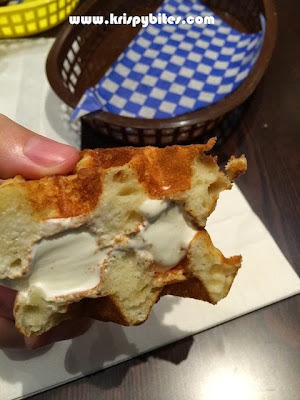 Mau5 was most impressed with how the waffle held everything together and found it a very tasty, Korean-inspired meal. 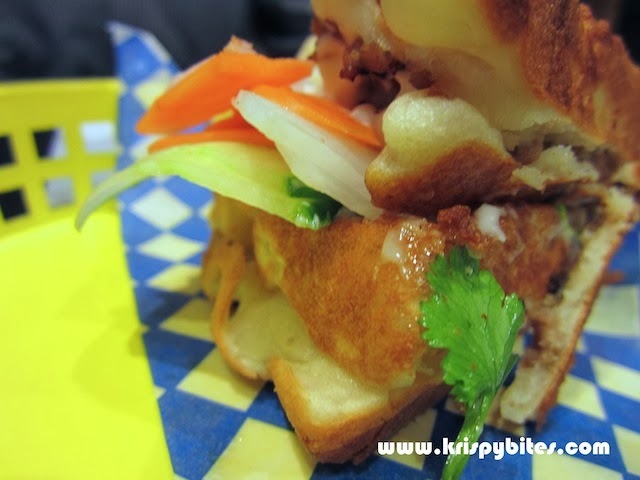 I like my Korean food strong, whether it's the spiciness of kimchi, the richness of pork neck bone hot pot, or the rich umami-flavor of bulgogi, and so found the flavors in this sandwich a bit too tame for my taste. Next came the nori chips, which are definitely something new on Miura's menu! They're basically sheets of seaweed deep fried and served as organically curled chips. Mau5 liked the nori chips primarily because they tasted less like seaweed, and he wanted something — wasabi mayo, perhaps? — to dip them in. 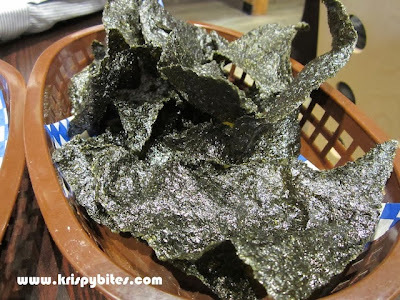 I didn't like the nori chips because I missed the crisp, sharp taste of dried seaweed and found the chips to be more like puffed up shrimp crackers. They're not bad, and are definitely innovative, but are also a bit of a greasy snack. The next sandwich that came was the hoisin sausage pork, with cilantro and pickled daikon, cucumber and carrot slices. The pickled vegetables gave a good, tangy contrast to the cilantro and pork. Mau5 found it tasty, but found the flavor of cilantro to be the focal point of this sandwich and wanted more pork and/or sauce to offset the cilantro. I didn't notice the taste of the cilantro as much as Mau5, but similar to him, the focal flavors in this sandwich were not the pork or hoisin sauce, but the pickled vegetables. 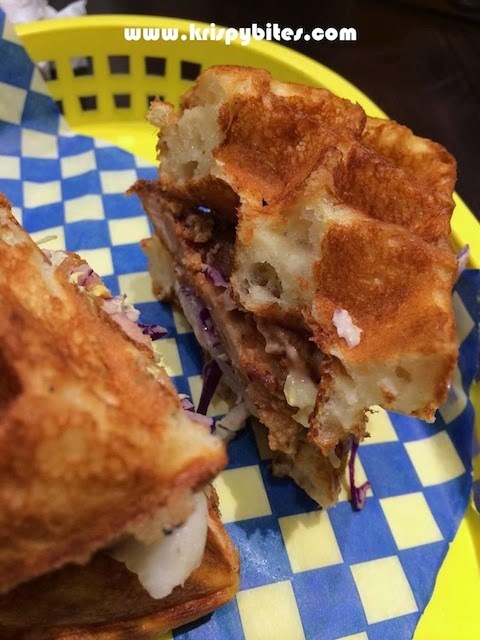 I liked that though; it somehow made the waffle sandwich seem healthier. 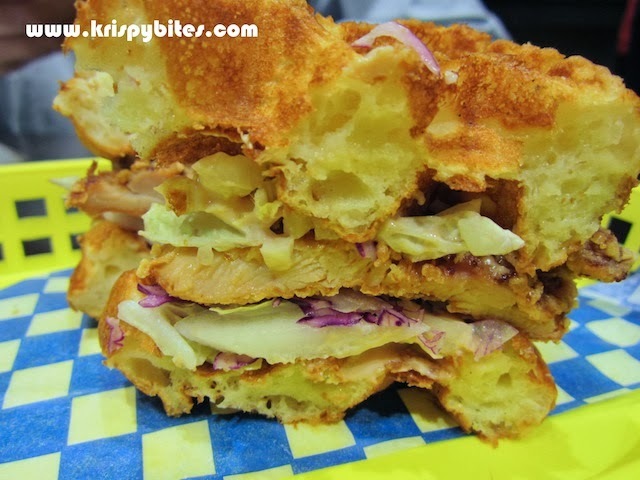 The chicken karaage waffle sandwich consisted of chicken karaage with shredded green and red cabbage. Mau5 and I both agreed that more sauce was needed, but they were understandably cautious because they didn't want to destroy the crispness of the chicken karaage. 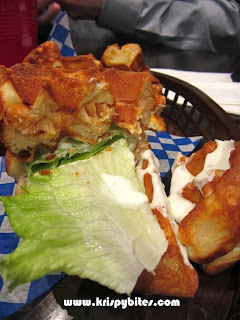 This was my favorite waffle sandwich of all, even though I am generally not a fan of chicken karaage. I think for me, this waffle sandwich set the bar for what good chicken karaage should taste like: the perfect ratio of breaded crispness to chicken meat that's not dry. 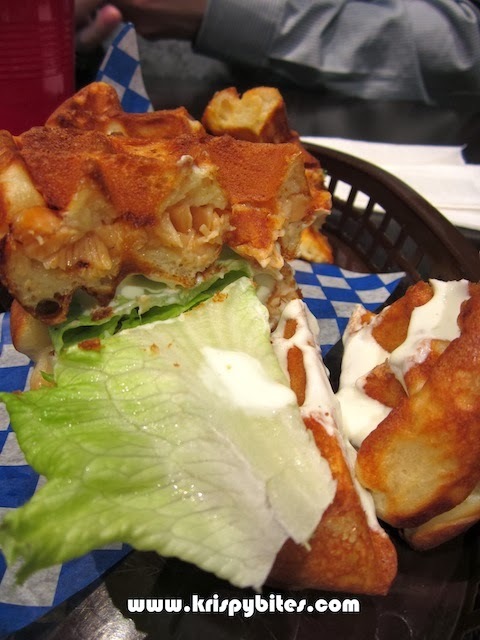 That, with the sweeter crunch of lettuce and sauce, made this the winning sandwich for me. 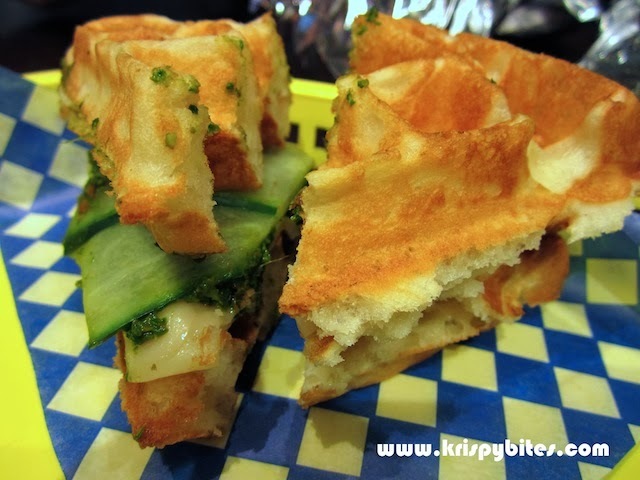 The next waffle sandwich was a vegetarian savory option, consisting of tomato pesto and slices of cucumber and cheese. Mau5 enjoyed it and was particularly amazed by the lack of dripping sauce, but felt that an option to add some kind of Italian deli meat would liven up the dish. 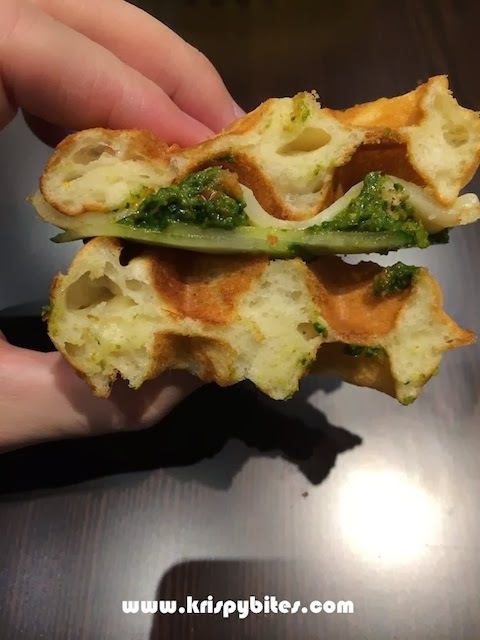 I enjoyed this sandwich for its simplicity of ingredients and presentation aesthetics - I loved how you could see the pockets of tomato pesto captured in the inverted valleys of the waffles. The tomato definitely adds another dimension to the pesto. 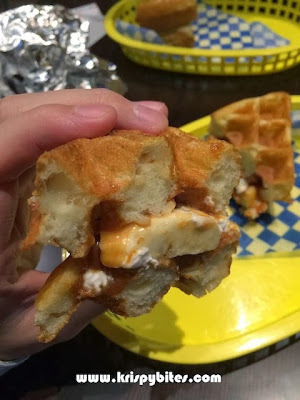 And then we moved on to the sweet waffle sandwiches. The first to come was the seasonal cranberry with whipped cream. Fresh cranberries are mouth-puckeringly sour, and while tangy, the cranberry puree/compote was neither overpoweringly sour nor overly sweet and went very well with the thick cream that accompanied it. As Mau5 noted again, there was no dripping. The next dessert waffle is Miura's top seller as well as the most traditional option: banana with whipped cream and drizzles of caramel. The last dessert waffle was the salted caramel ice cream, to which Mau5 raved, "Pow right in the kisser! Is it salty? Is it sweet? The answer is yes! 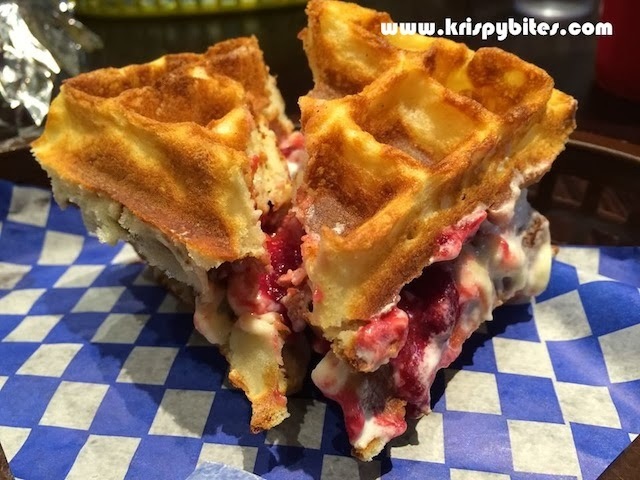 The ice cream fits perfectly into the waffle squares, a hint of salty caramel will go well with the caramel milkshake. First choice for dessert." I liked it too —it was delicious ice cream, after all! — but not as much as the cranberry whipped cream, although more than the banana caramel. 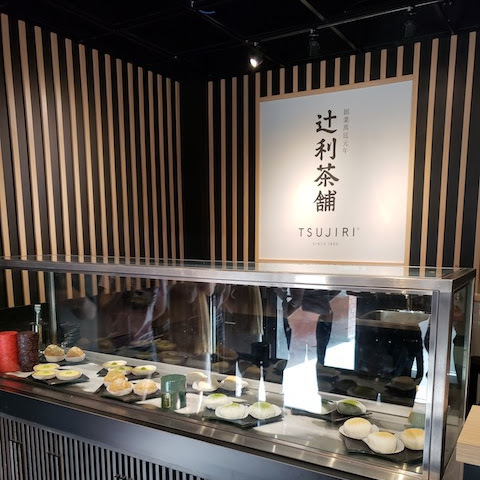 Miura has revitalized their menu a bit for their new location, keeping favorites but tinkering with some of the recipes. 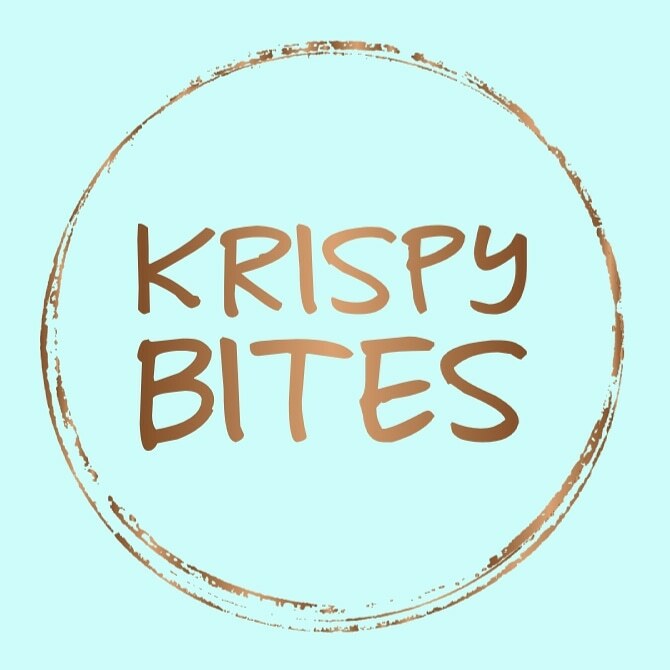 Their new location is just off of Broadway on Main St, beside the easily recognizable Kafka's Café and is readily accessible by transit. If you drive, take one of the side roads to hunt for a parking spot. 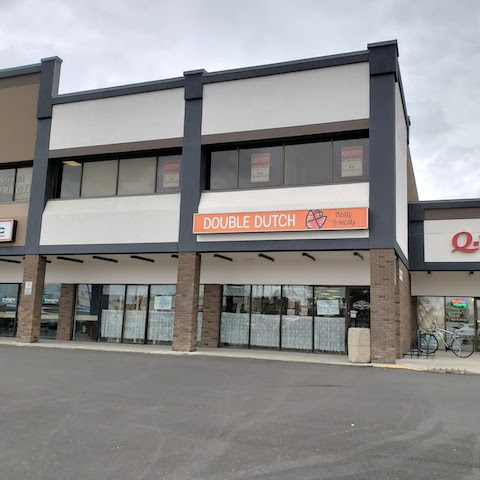 They've kept their previous theme of being a place to grab a quick bite to eat, with a modern café décor, bar stools along the walls and windows, and a self-serve carafe of water by the cashier. And judging by how quickly we were served the different waffle samplers, they're ready for hordes of hungry Mt Pleasant crowds.